Your banjo teacher’s a local legend, but a likable guy. And impressive. He plays every instrument there is, even the bagpipes, although he seems most interested in trumpet. But he does know the banjo, which is why you’re there. At your last lesson you gave him Steve Martin’s all-banjo album, The Crow, Steve playing the banjo like a pluckin’ madman on 16 cuts. The fact that this album is titled The Crow has nothing to do with your interest in birds or banjos. You figured your teacher would like it and you wanted to give him something good for a change to listen to. Your pathetic strumming wasn’t getting the job done, although you liked the music and figured there’s nothing coming out of a banjo that isn’t just a two-fisted cool sound. Truth is, sure, you heard. It was banjo. A lot of fast plucking and a wild happy sound. 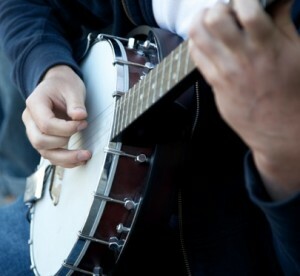 The reason you’re taking banjo lessons. Your desire to play started when you heard the audio book of Steve Martin’s life, Born Standing Up, and Martin used banjo riffs in between chapters. You wanted to make that kind of noise. But that’s not what the guy was asking. He gets a CD player and hits the button. And your teacher indicates the lower part of the banjo’s neck. “And he’s making all the melody with the strings, no chords.” You figure, okay, if he says so. It still just sounds like a lot of banjo noise. Not bad, but nothing discernible. And then he hits another cut, “Get this?” And you listen, but get nothing. “He’s doing claw hammer. That’s amazing. Nobody does that kind of thing any more. “Okay, enough.” You figure this guy’s hearing something you just can’t. But he’s been making music for more years than you’ve been alive, so maybe he’s learned a thing or two about it. Still, you feel bad. Because you’re not hearing, identifying, digging and loving something that’s apparently worth knowing about. There’s a window behind your teacher. It’s not your teacher’s fault. Another bird flies by, way off in the distance. You say, “See that bird flying, what kind is it?” And he says, laughing, “ I don’t know, man, it’s a bird.” And you know it’s a Blue Jay. 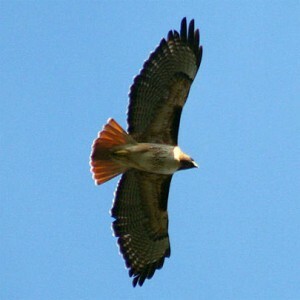 Come on, the long tail, the stubby wings, the strong but erratic flight. Obvious. And a good thing to see, too, since West Nile has all but wiped out the Jays around here. But your banjo master just saw a bird, that’s all. And you only heard banjo music, that’s all. You didn’t get the details. He didn’t get the details. And this drives home an essential truth. Not just about birds or banjos but about everything we know and don’t know: When you learn about a thing, you see it differently. No, not just differently, better. This is not a value judgment. Not a subjective opinion. It’s reality. A guy who spends forty years with banjos hears notes and subtleties that a dope like you can’t possibly get. He’s better off because of that. He lives in a beautiful world of complex surprising music while you hear what is essentially pretty noise. You have something else, though. For some inexplicable reason, you have picked up bird knowledge since you were a little kid intrigued by a bird book, and have regarded seeing birds as something akin to stamp collecting. Because of that, you know every kind of bird that flies past. You don’t see birds, even if they’re shadowy silhouettes at a distance; you see herons with long unmistakable curled necks, and raucous crows with unbeautiful flapping wings, and hawks you’re envious of, powerful buteos with awesome wingspreads. Boring sparrows; and robins who no longer migrate in this changed climate. And you know a grackle by its tail and a starling by its tubby mundane body shape. You and your banjo teacher are alike. You both know a subject and get the details of it while other people might blithely stumble by, missing these details. And you figure, wait, if this is the way it is with banjos and birds, maybe it’s like that with…. everything. Of course, you’re right. Ad executives don’t see billboards…they see cost per thousand drive-by impressions. You remember working in a Chinese take-out joint when you were a kid. The boss asked you to go to a newly opened rival Chinese place and order egg rolls to bring back for analysis. He dissected these, muttering Mandarin about the contents. He didn’t see egg roll stuffing; he saw everything he needed to know about his competitor. …it was a lousy job, but you came to know everything about truck tires. While waiting for a light, you looked at the truck next to you and said to your wife, “diagonal lugs on that 275/70R22.5 baby,” or some such arcane nonsense. But wait, that was good. But they did have the music, that’s for sure. And you may be tone deaf, but you’ve got the birds. And when you see them you know that they’re not just birds. They’re Rock Doves and Mourning Doves and Cedar freakin’ Waxwings and Merlins with mice in their bellies, and you’re better for it. Strum that tune, Steve Martin. This entry was posted on Thursday, July 9th, 2009 at 8:48 pm	and is filed under "Viewpoints". You can follow any responses to this entry through the RSS 2.0 feed. You can leave a response, or trackback from your own site. What a beautiful post. And the perfect antidote after a screamingly trying day. It even prompted me to pick up my fiddle. Music, the great healer! Wow, this is the first time that I’ve ever really gotten WHY it feels so good to see a bird and know what it is–it’s deeper into that world. Cool. sue, I definitely do this with plants, but mine are all wild plants. I glace out the window as the car moves on its way to work, my mind labeling each weed and plant I see. Knowing which plants are out there, whatever the season, makes me happier somehow. When I can identify a bird by sight and sound I get the same happier, at-home feeling, too. been in retail horticulture all my life and I do the same thing with plants. I don’t look at my hedgerow and think ‘shrubs’, I think toyon, arbutus, prunus, redbud, live oak, coffeeberry,… it’s like seeing an image of friends where your mind puts names to faces: “Nancy and Pat, Diane and Phil, Linda and Paul and Neil…” I’ve always wondered if others do the same. Aren’t our brains and how they’re wired (differently) fascinating?! I understand the whole banjo thing. I never really cared about music other than whether it sounded nice or not – can’t even read it. But I can ID birds like *that*. My mom’s the opposite. It’s funny sometimes. Buried in a website ostensibly about birds one finds philosophy–as in this post–interesting observation, and a literary hand at work. In fact the literary hand is evident in many other posts here, as well as interesting and accessible commentary about birds and birding. This material ought to be assembled into a book. But wait. Books are a medium of the past and web posting is the medium of now and going forward. So maybe this is all perfectly where it should be. So much fun reading. Thanks Mr. Two-fisted “writer” (and birdwatcher).